A publicity still of Frankie Avalon, Mary Mitchel, Ray Milland, and Jean Hagen in the apocalyptic thriller Panic in Year Zero! (1962). This article is part of The End of the World Blogathon hosted by MovieMovieBlogBlog and The Midnite Drive-In. A gentle warning that this article has spoilers for Panic in Year Zero! (1962). Also, it will probably help your enjoyment of the article if you watch the movie first and realize that the following "advice" is intended to be humorous. I live a mile from an U.S. military base so, for me, the prospect of nuclear annihilation is a real one. 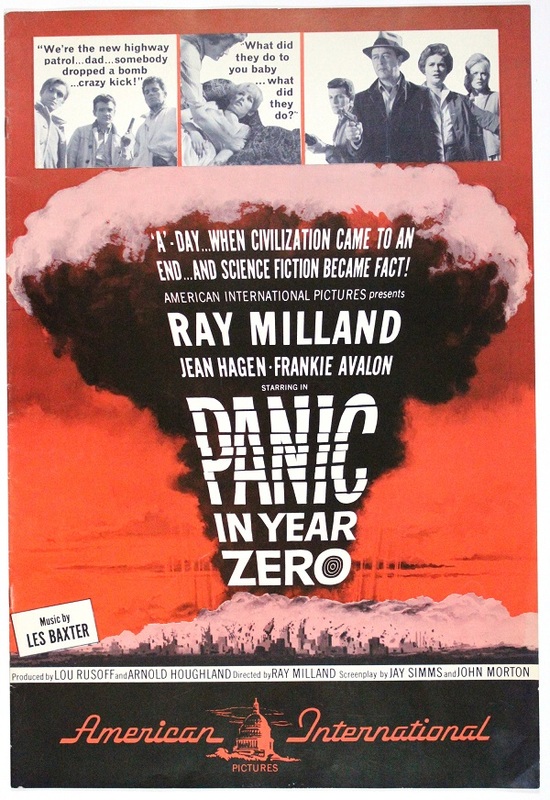 I probably won't survive the mushroom cloud if Kim Jong-un, Vladimir Putin, et al decide to drop a big one on the Midwest, but, thanks to the low-budget thriller Panic in Year Zero! (1962), I can prepare my fellow old Hollywood fans for an eventual nuclear apocalypse. 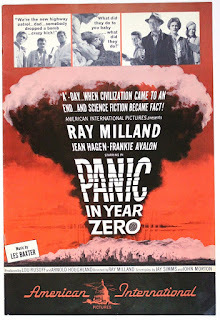 Panic in Year Zero! 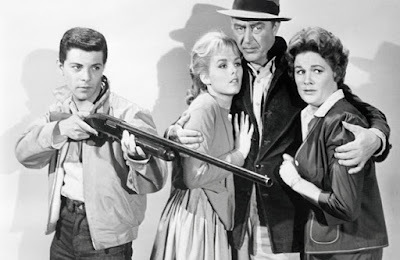 tells the story of the Baldwins, a regular sixties family consisting of dad Harry (Ray Milland, who also took on directing duties), mom Ann (Jean Hagen) and teenagers Rick and Karen (teen idol Frankie Avalon and Mary Mitchel). The happy family leave their home in Los Angeles for a weekend fishing trip, but after a few hours of driving they see a large mushroom cloud explode over the city. 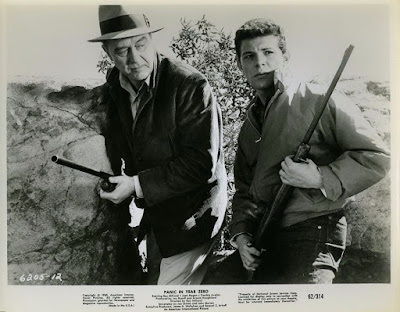 The Baldwins soon find out that they are among the last survivors of a nuclear war, and the formerly mild-mannered Harry takes increasingly desperate measures to protect his family amid the collapse of civilization. Based on my viewing of Panic in Year Zero!, here's my tongue-in-cheek advice on how to survive the end of the world. 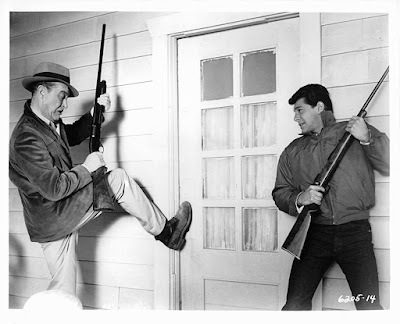 There's no doubt that Harry is the large-and-in-charge alpha male of the Baldwin bunch, but none of his hare-brained schemes would have come to fruition without the loyal assistance of his teenage son, Rick, who eagerly complies with his father's orders no matter how illegal, dangerous, or just downright dumb they happen to be. In fact, Rick holds up gas stations, tears down bridges, and ( I am not making this up) sets a major Interstate on fire with such cheerful nonchalance, that it might be worth your time to look up the former teen idol before heading out to hide in a cave somewhere. They didn't have bank cards or PayPal in 1962, which, as it turns out, comes in really handy when civilization as you know it is obliterated. Harry carries a wad of cash that, as my late grandfather used to say, is "large enough to choke a horse," and he's not shy about spreading the benjamins around in a tight spot. All that blah-blah-blah about defensive driving and proper turn-signal use isn't worth a hill of beans once your up against marauding hordes of nuclear fallout survivors (just FYI, marauding hordes in the context of Panic in Year Zero! means the five or six extras Milland could afford). Just put the pedal to the metal and crash through anyone or anything in your path. Alternatively, set the Interstate on fire. Harry wears his trusty fedora throughout most of Panic in Year Zero, including when he is inside a cave. My mother's theory is that Milland thought this made him look younger on camera, but I suppose it's also possible that stylish headgear could ward off radiation. I really don't have much to say about this one other than hauling off and belting someone really seems to work across the board in classic movies, so it probably won't hurt to try it out at the end of the world. Seriously, here's to a long, happy, and classic-movie filled life to all of us. Don't slap anybody and don't go in search of Frankie Avalon unless it's to tell him how much you like his performance in Panic in Year Zero! 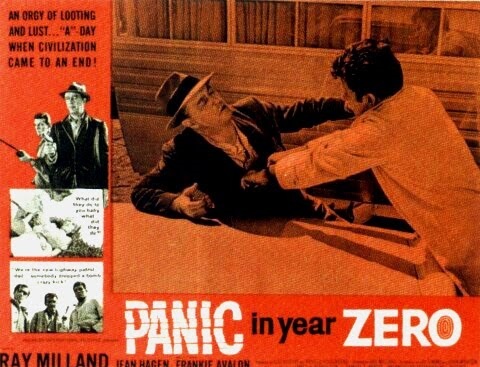 Panic in Year Zero! is available on DVD and video on demand. Having done Panic in te Year Zero! for an earlier blog entry, I thought it was pretty good for a low budget entry. Nice take on the film. Even though I was joking in the article, Panic in Year Zero! is actually a good movie. It is very well-directed and there are good performances all around. It's also a great time capsule for the Kennedy-era nuclear scares. That was fun and I appreciate it. I sometimes have difficulty finding the fun in such scenarios. I turn as serious as I assume the filmmakers to be. PS: I thought Milland kept his hat on so he wouldn't have to wear his toupe or to keep the old hairpiece in place. Of course, that's another assumption that he had started to loose the follicles at this time. I think you've got it on the hairpiece. He probably had to much to do with acting and directing to worry about. Hilarious review! This appears to be another of those end-of-the-world movies that didn't have much on the brain. 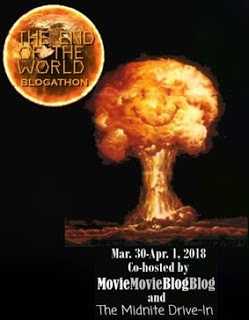 Thank you for contributing to the blogathon! Ha! Loved this. I was thinking about this film the other day, and how I need to see it again, and here you are with this cheeky review. I've only seen the film once and – can you believe it – I missed the last 20 minutes! Between your fab review and the unknown ending, I need to track down this film ASAP.